If tired of dull hair and damaged scalp and aiming to have the kind of hair celebrities proudly display, learn that there is a way to attain that without paying a fortune on expensive treatments. Nuviante promotes long and strong hair, from the roots to the tops. By nourishing the hair follicles, this ultimate hair-booster naturally allows you to grow shiny and healthy hair. Like never before. Hair loss, on the other hand, is becoming a disagreeable problem both men and women experience, especially after 30 years of age. Pollution, poor diet, genetic predisposition, stress are all triggering factors for this embarrassing social problem. Nuviante is the potent supplement that reverses the hair loss process, in an easy, safe and natural way. The selected ingredients in its formula work together to boost hair’s appearance and health. Biotin: also referred to as vitamin H or vitamin B7, biotin is a type of B complex vitamin that promotes hair health. 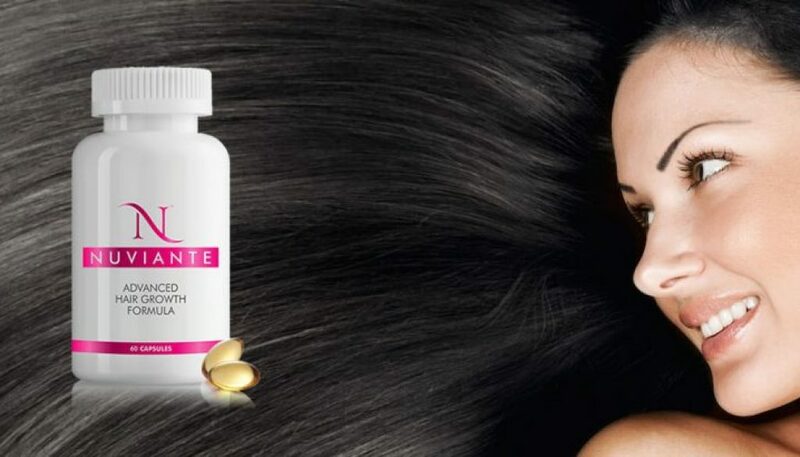 As biotin deficiency leads to hair breakage and brittle nails, the extra amount of biotin in Nuviante will be highly beneficial for both. Pantothenic Acid: strong follicles and a rapid hair growth is what vitamin B5 can do to help you have the glamorous look of celebrities. Horsetail: or Equisetum ravens contains minerals that are essential for hair and nails growing process. Para-Aminobenzoic Acid (PABA) – protects your hair from the damaging effect of free radicals. Other Ingredients: Vegetable Cellulose, Silica, Vegetable Magnesium Stearate. Use Directions: take up to 3 tablets a day, after consulting your doctor. For best results, make sure you lead a healthy lifestyle and you eat a healthy diet.